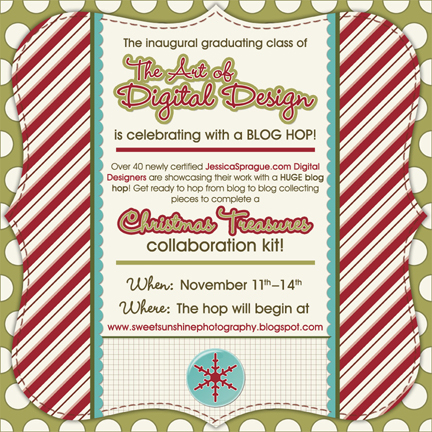 Jessica Sprague’s first class of Art of Digital Design graduates will be contributing to a blog hop to bring you digital papers and elements from a collaborative kit Christmas Treasures. To collect these amazing digital goodies you need to hop from one blog to another. Over 40 new graduated designers created some stunning mini kits for you to collect! The collaboration kit preview will be available on Nov 8th. The blog hop will take place from the 11 to 14 November, starting with Lisa’s blog at sweetsunshinephotography.blogspot.com. Join us for this hop and celebrate !